Dosing of ALBENZA will vary depending upon the indication. ALBENZA tablets may be crushed or chewed and swallowed with a drink of water. ALBENZA chewable tablets are also available for children and patients who may experience swallowing difficulties. ALBENZA tablets and ALBENZA chewable tablets should be taken with food [see Clinical Pharmacology (12.3)]. Each white to off-white, circular, biconvex, bevel-edged film coated, TILTAB tablet is debossed with "ap" and "550" and contains 200 mg of albendazole. Each round, mottled pink, concave chewable tablet is debossed with "ap" above "551" and contains 200 mg of albendazole. Inactive ingredients consist of: lactose monohydrate, microcrystalline cellulose, D-mannitol, sodium starch glycolate, povidone, N-C Wild Berry Type Flavor, magnesium stearate, crospovidone, polyvinyl acetate, sucralose, colloidal silicone dioxide, sodium lauryl sulfate, D&C Red #30/Helendon Pink Aluminum Lake. In a study conducted in 113 fed and 117 fasted healthy subjects, ALBENZA chewable tablets were bioequivalent to ALBENZA tablets following single 400 mg oral doses of albendazole. In this study, the average time to reach the maximal plasma concentrations of albendazole sulfoxide was 4.5 hours (range 2 to 10 hours) with a fatty meal (fat content 60 grams) and at 3 hours (range 1 to 5 hours) in the fasted state. Following administration of ALBENZA chewable tablets, average maximal plasma concentrations of albendazole sulfoxide were 804 ng/mL (range 202 to 2244 ng/mL) and 218 ng/mL (range 54 to 592 ng/mL) in the fed and fasted states, respectively. The apparent elimination half-life of albendazole sulfoxide was comparable between ALBENZA chewable tablets and ALBENZA tablets when both were given either under fed or fasted conditions. Some people, particularly children, may experience difficulties swallowing the ALBENZA tablets whole. ALBENZA chewable tablet is available for children and patients who may be unable to swallow a tablet. 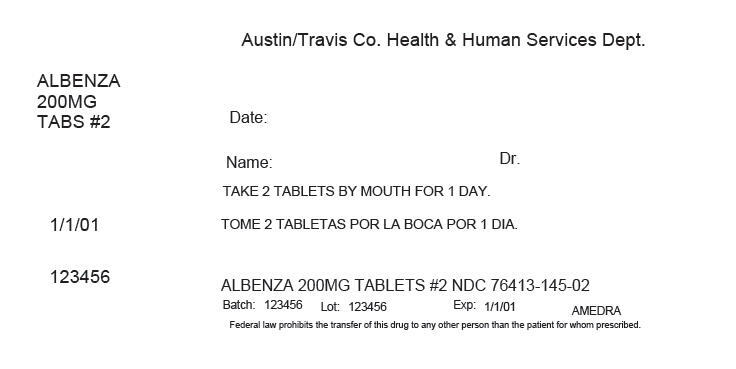 Austin/Travis Co. Health & Human Services Dept. TAKE 2 TABLETS BY MOUTH FOR 1 DAY. Federal law prohibits the transfer of this drug to any other person than the patient for whom prescribed.